Pregnancy is a thing of joy but seeing your body change before your very face in terms of adding a few pounds to your body weight is really something you can't help but think about constantly. 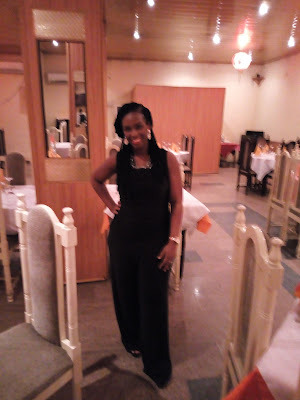 I remember publishing a post here > chidinmainspirations.com/2016/11/pregnancy-difficulties-and-sad.html?spref=tw … of how many were saying it will take forever for me to lose my baby weight etc. Well, I am happy that, that forever was just 3 weeks. *Smiles* As you read this post, I hope you draw an inspiration from what I did and also drop those few pounds you want off your body weight because I know you can do it. So, how did I lose my baby weight just 3 weeks after delivery? Simple...through the help of my Mum when she came for omugwo. Firstly, I was breastfeeding my baby. The more I breastfed my baby the more I noticed my tummy was contracting back to its pre-pregnancy state. Secondly, I ate strictly fruits and vegetables. I drank mainly pepper soup with fish (anything fish other than meat like stockfish, smoked fish, fresh fish etc) and also ora soup (how to prepare it here). Thirdly, I didn't take any carbohydrate at first. The only carbohydrate I ate was rice and it was in little quantity also filled with fish. When eating my soup, I ate it along with nothing but wheat. Fourthly, I embarked on hot water therapy. Whenever I wanted to drink water, I drank only hot water. Though it was not convenient particularly in days when the weather was hot because you tend to sweat a lot. However, the sweat coming out from your body is just fats leaving your body. I diligently did these everyday and the first time took a picture of myself, I couldn't believe it. I still do the hot water therapy till now. I remember going for a friend's child dedication (we gave birth in the same hospital a day apart) last 2 Sundays, she asked what I did to my tummy that it had gone back inside. I said I always drink hot water. She said really? I said yes. She said wow! And it is cold water she has been drinking since. She need to start this hot water therapy immediately. I hope you were inspired by this post? Please share with others to inspire them too. with the hashtag life e.g #Life or #Inspiration I hope you love and get inspired by what you find. can i do this even if i dont breastfeeding or having a child. Yes dear you definitely can. All the best!!! Drinking hot water sure does wonders. Images used on this blog can easily be obtained from the internet and are appropriately referenced. Powered by Blogger.